Mike Masnick posted video of a pretty good lecture on successful “music” business models based on the success of Nine Inch Nails’ Ghosts I-IV and other efforts. 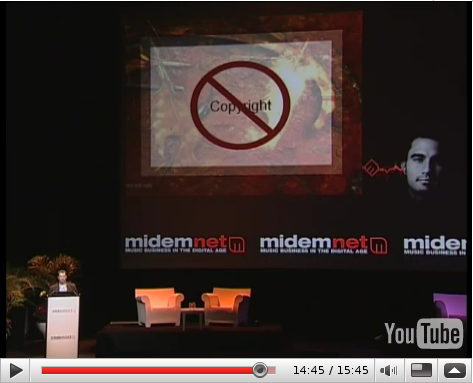 Earlier today I praised the lecture on the Creative Commons blog. At the end of the video Masnick says that copyright isn’t even necessary for the model he describes (capture above), and that hearing this upsets people. But this begs the question of whether any “business model” is necessary for music at all. My other complaint (and I’m almost as guilty as anyone) is a near total failure to look at obvious examples slightly outside the contemporary first world milieu (i.e., the past, future, and much of the present world). This is a general unrelenting complaint, not directed at Masnick’s 15 minutes in front of an industry conference! Support the Free Software Foundation. It’s good for a free planet and you can attend the just announced Libre Planet Conference, March 21-22 in Cambridge, Massachusetts, an outgrowth of the FSF’s annual member meeting. I’m really excited that the conference will have software freedom and network services as a major focus. This will be the first public conference on the topic, following last year’s meeting from which followed the Franklin Street Declaration and Autonomo.us. If you enjoyed my rambling call to support Creative Commons a couple months ago, you might enjoy reading Benjamin Mako Hill’s somewhat less rambling call to support the FSF. I’ve donated to the FSF off and on since at least 1998. You should get started now, if you haven’t already. My only regret (apart from not giving every year) is still not having relevant prediction markets enabling me to be a futarchist donor. I mention that here both because it is a necessary disclaimer for me to make (my philanthropy suggestions are not based on handwaving, not consensus projected impact) and because perhaps my most highly desired free network service is a prediction market exchange. I’ll explain more another day. My opinions only. I do not represent any organization in this publication. Everything by me, published anywhere, except where otherwise noted, is dedicated to the public domain.